Happy Friday Everybody! This week while most of the country is covered in snow, I’m taking us on a tropical adventure! Can’t you just hear the calypso music and the gentle sway of the breeze through the palm trees? Not to mention the crystal clear blue water and the miles of pristine beaches of Castaway Cay. If you have ever been on one of Disney’s fabulous Caribbean Cruises then this kit is for you! If a Disney Cruise is not always on your itinerary don’t worry, this kit is perfect for Disney’s resort pool pics as well as the beaches of the Polynesian, the Yacht and Beach Club or the Grand Floridian. This kit is just overflowing! There’s 15 papers in wonderful tropical patterns. Along with over a whopping 75 elements. There’s waves, a beach umbrella, life savers, starfish, a cabana, palm tree, flowers, genuine sand castle, ribbons, buttons and much more. You won’t believe the amount you’ll have to scrap with! 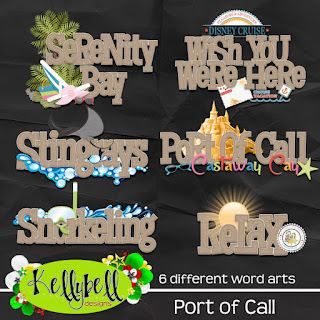 Check out these word art titles! Just perfect for all the fun in the sun! The pagestarters are such a time saver. They clustered perfectly most of the time all you need to do is add a photo or two and you're on your way to a beautiful page! Journal cards are the perfect addition to a page. They add just the right sentiment. 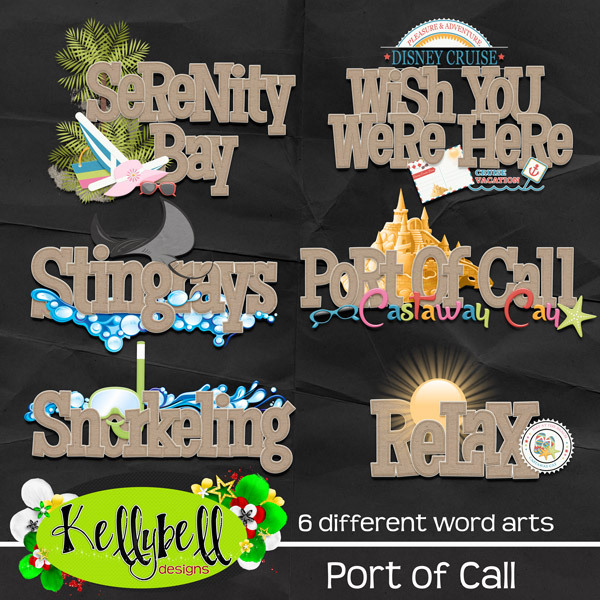 Check out the matching journal cards for the Port of Call kit. 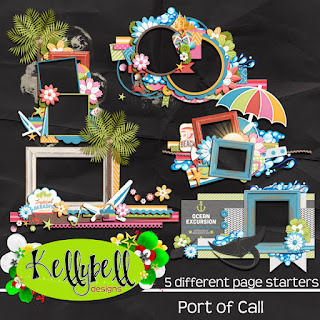 You can find the whole collection at Kellybell Designs for 25% off this weekend only. There are so many tropical locations at Disney. This collection is perfect for scrapping any of those events. Here are two layouts I made. Still trying to catch up on our 2005 Disney Cruise/vacation scrapbook. Isn't that such a tropically fun collection? If you’re ready to grab your 3 matching freebies, you’ll need to know where to start your journey. Today you’ll find a beautiful freebie on Jennifer's blog, one at Julie P.'s blog and another on Jenn’s blog. Be sure to give a shout out to the girls along the way. Have a fabulous weekend! And don't forget to Scrap Out Loud!